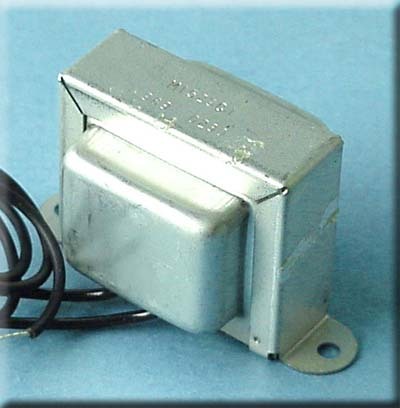 Allen transformers are perfect for repairs and replacements of most of the more popular vintage Fender amplifiers or for your own custom-built projects. 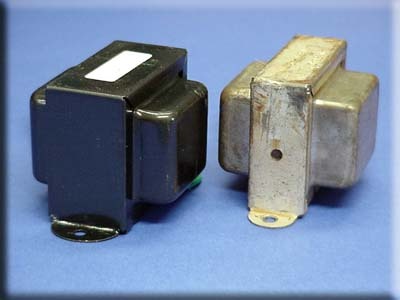 Period correct voltages and equal or better current ratings. Direct bolt-in replacements with no drilling necessary. 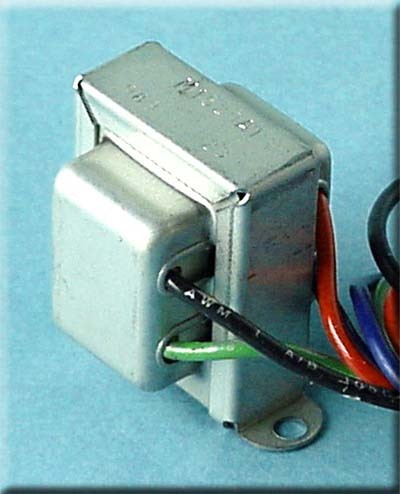 Improved features such as Unistrand pre-tinned wiring for easy soldering, center-tapped heater windings on power transformers for convenient grounding (without the need for 100 ohm grounding resistors at the pilot light) and internal hum shield brought out to a lead for grounding power transformers to reduce hum emissions. 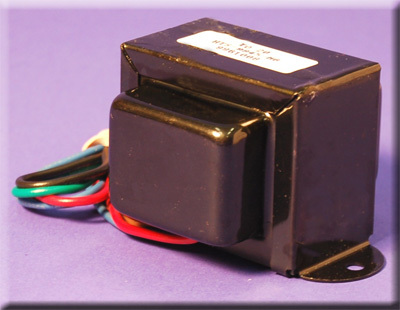 TP24 power transformer requires a full-wave-bridge type solid-state rectifier. It does not support a tube rectifier. 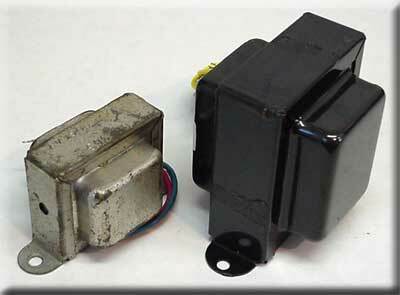 It is rated 120V to 280V at 200mA with a 6.3V center-tapped heater winding rated 4A. It will support a power supply rated approximately 365V DC at 150mA DC. This is sufficient for a pair of EL34s in fixed bias or a pair of 6L6s in cathode bias or a single ended amp using a big 6550/KT88 power tube - plus 3 or 4 preamp tubes. It also has a pair of brown leads rated 20V at 100mA. This makes it a great bolt-in upgrade for the Blues Jr. (same color code leads, too) where a little higher B+ voltage and better voltage regulation are desired for more headroom or where 6L6/EL34 power tubes are to be installed for a more powerful amp. 2" by 2-1/2" mounting centers means it will fit a Champ or Princeton chassis. 2-5/8" tall above mounting surface. 3.8lbs. 10" Unistrand pretinned leads. 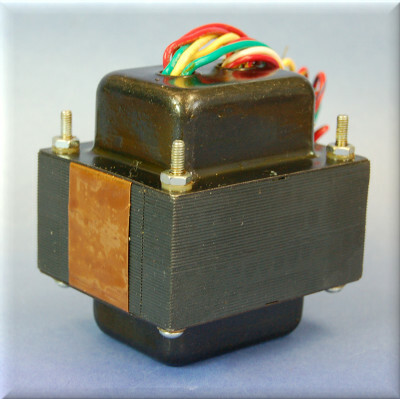 A great project transformer that is compact and powerful and produces a more reasonable B+ voltage making it suitable for many cathode biased, single-ended and EL84 based circuits. Made in the U.S.A! Add $10 for push on connectors for a Blues Jr. amp. 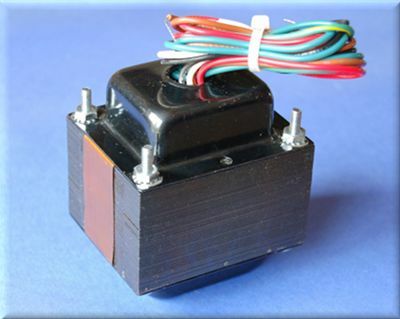 Upgrade Power Transformer for BF/SF Champ, VibroChamp, Bronco, and Princeton. 310V-0-310V @ 150ma, 6.3V at 4.5A, 5V at 2A. 50V bias tap, center-tapped heater winding and internal hum shield brought out to a lead for grounding. 2" by 2-1/2" mounting centers, 5.1lbs. Unit is approximately 1" taller than a stock transformer. Supports the use of both 6L6 and EL34 power tubes (with proper socket wiring). Now featuring M-6 grain oriented lamination steel for cooler operation. Dual voltage secondary power transformer for both tweed and blackface Deluxes. 270V-0-270V secondary for tweed and 320V-0-320V for blackface/silverface, both at 120mA continuous. 6.3V@3A heater winding and 5V@2A filament winding. Hum shield, copper flux band and heater center tap for lowest noise/hum emission. Old school paper-wound construction and made in the U.S.A! 2-1/4" by 2-13/16" mounting centers. 4.5 lbs. Upgrade power transformer for Deluxe/Deluxe Reverb amps. 320V-0-320V at 180ma, 5V at 3A and 6.3V at 4.5A. Supports the use of 6L6 AND EL34 power tubes (power tube sockets must be rewired for use with EL34 power tubes). Center tapped heater winding, 50V bias tap, copper flux bands and internal hum shield brought out to a lead for grounding (ensures the quietest amp possible). 2-1/4" by 2-13/16" mounting centers. Unit is approximately 3/4" taller than a stock PT and weighs 6.7 lbs. Great for high powered 5E3 projects, too. 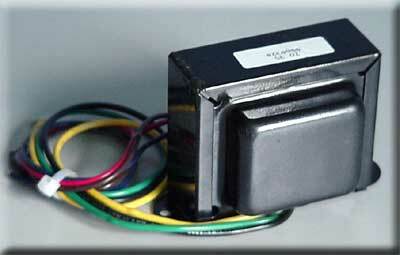 Replacement Power Transformer for Super, Bassman, Pro, Vibroverb, and Bandmaster. 340V-0-340V at 200ma, 6.3V at 5A (supports EL34s! 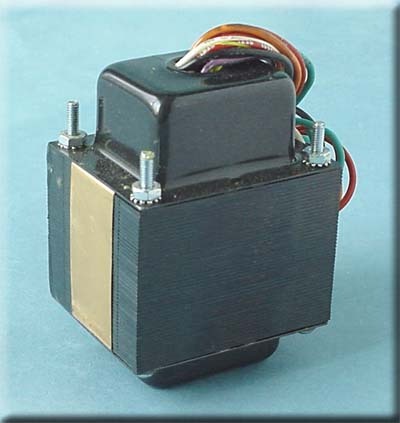 ), 5V at 3A. 50V bias tap, center-tapped heater winding and internal hum shield brought out to a lead for grounding. 2-3/4" x 3-7/16" mounting centers, 7.6 lbs. Excellent replacement is quieter and cooler running than most originals. 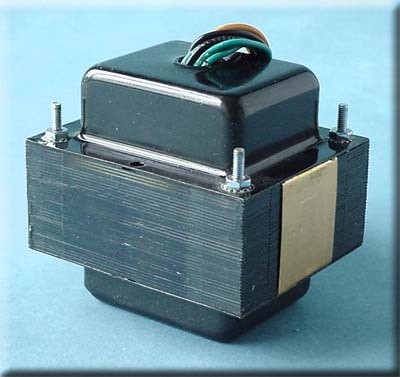 TO8S Heyboer output transformer is rated 8,000 ohms primary to 8 ohms secondary. It is basically the above TO8C unit mounted the "short way" and without the 4 ohm tap. 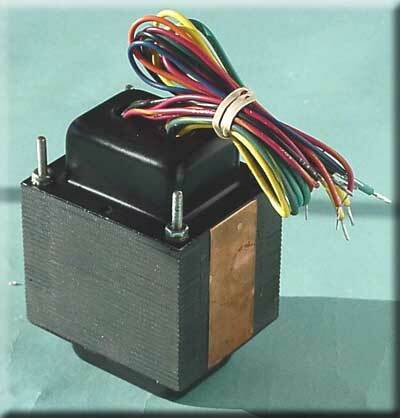 This physical orientation relative to the power transformer eliminates any transformer coupled hum and is thus quieter. It has wider mounting dimensions of 2-13/16" so it would require drilling one new mounting hole for a Champ installation. It is the same size as the larger Fender choke. 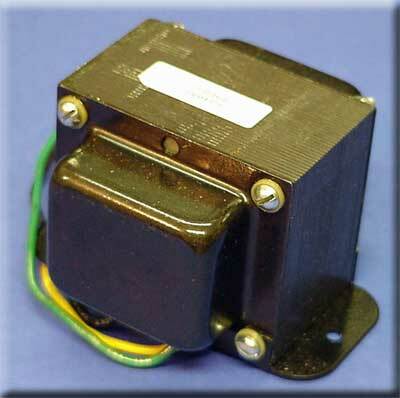 Single-ended output transformer for a single 6550/KT88 power tube and an 8 ohm speaker load. As used in the new 14 watt Chihuahua amp. 3,000 ohm primary is rated 150mA continuous for single ended use. M-6 grain oriented core steel for maximum output and definition. 12" Unistrand pre-tinned leads and black oxide finish. 3-1/8" mounting centers. 2-1/4" high and 2-1/2" wide. 1.6 lbs. 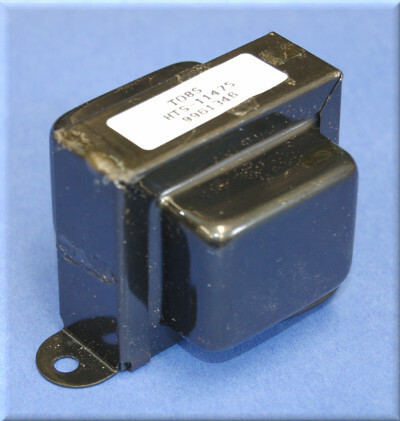 Bolt-on upgrade output transformer rated 6,600 ohms to 8 ohms with 2-13/16" mounting centers. Wider 1-1/4" lamination "fat stack" gives this unit more than 60% additional core mass than typical 3/4" stack units (see photo) for improved performance. Special grain-oriented M6 core steel provides maximum output and punch (over the whole guitar spectrum) from a pair of EL84s or 6V6s while its low profile easily clears speakers in combo amps. This unit is a direct bolt-on upgrade for amps such as the Blues Jr. and Princeton Reverb amps and a good choice for 2xEL84 or 2x6V6 projects using an 8 ohm speaker load and where a compact unit is desired. Great for Princeton Reverbs with a 12" speaker installed. 2" tall, 2-5/16" deep and 2-5/8" wide across end bell covers. Black oxide finish with 8" leads. 1.6lbs. Custom paper stick-wound in the USA by Heyboer! Add $5 for push on connectors for a Blues Jr. amp. 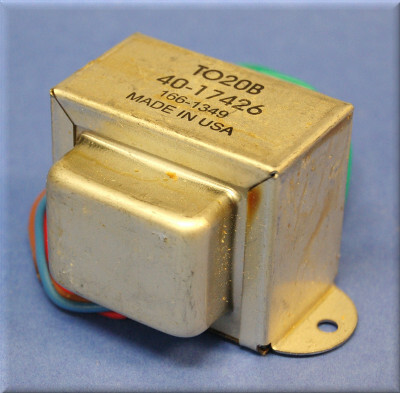 Similar to the TO20 above, the new TO20B (Bifilar) output transformer is rated 6,600 ohms to 8 ohms with 2-13/16" mounting centers and a "fat stack" of M-6 low loss core steel. It has 10" Unistrand leads and weighs 1.6lbs. The bifiliar wound unit takes a more "hi fi" approach to design for improved bass response and extended frequency response. The center tap for the primary is the center of the number of turns and also the center of the DC resistance. It is a high quality paper stick wound unit made in Chicago. ETP finish. Excellent upgrade for Blue Jrs, Pro Jrs, Princetons, old Gibsons®, others. Add $5 for push on connectors for a Blues Jr. amp. NEW! TO20MT - same as a TO20, but with 4 ohm and 8 ohm leads. Add $5 for push on connectors for a Blues Jr. amp. A beefier output transformer with 50% more core steel for Deluxe, Deluxe Reverb and similar 2x6V6 based amps bolts right in with the standard 3-1/8" mounting centers (fits a Princeton, too!) and has both 8 and 16 ohm taps for single and dual 8 ohm speaker configurations. Custom wound exclusively for Allen Amplification and made in the USA by Heyboer this unit features a special high performance core steel for maximum output and clean bass. 7,000 ohm primary to 8 or 16 ohms. Also works great with a 2x6L6 or 2xEL34 amp (with 4 or 8 ohm speaker load) where the intention is to limit the output with core saturation for natural compression and sustain. Low profile "fat" design to clear the speaker in combo amps. Excellent choice for 18W Marshall and similar 2xEL84 amps, too. Paper tube, paper-layered and specially interleaved windings, cool black oxide finish and 12" pretinned Unistrand leads for fast installation. Stainless-steel mounting hardware is included! 2-1/4"H by 2-1/2"W and 1.6lbs. A high quality replacement output transformer for Vibrolux, Pro, Bandmaster, Vibroverb and Tremolux amps and "vibroclone style" projects. Custom wound in the USA by Heyboer on a paper tube with paper layered and specially interleaved windings with a 4K ohm primary and both 4 and 8 ohm secondary taps for one or two speaker set ups. As used in the Accomplice, Brown Sugar and Encore amplifiers. Special low insertion loss lamination steel for increased output. Black oxide finish with 12" Unistrand pretinned leads for fast installation. 3-9/16" mounting centers. 2.4 lbs. 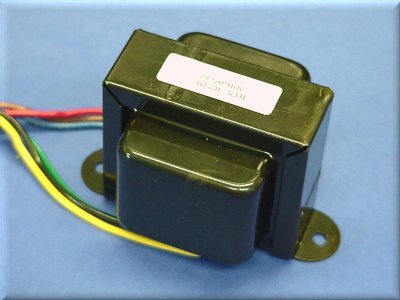 A very sweet sounding transformer for 2x6L6 amps. Stainless-steel mounting hardware included! Another exclusive Allen/Heyboer design provides a very robust 4 lb. output transformer to exactly fit the 2-bolt 3-9/16" mounting centers of a Vibrolux, Pro, Bandmaster, Vibrolux or Tremolux chassis without drilling. 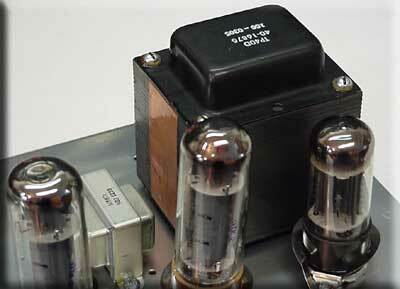 Get the increased bottom end performance and headroom similar to the 4-bolt Super/Bassman style output transformers. As used in the Old Flame amplifier. 4,000 ohm primary to 4/8 ohm secondary. Custom wound in the USA on a paper tube with paper layered and specially interleaved windings and featuring special lamination steel. Black oxide finish with 12" pretinned "Unistrand" leads for quick installation. Includes heavy duty #10 stainless-steel mounting hardware! Replacement Choke for Twin, Super, Pro, Bassman, Bandmaster, Vibroverb, Showman, Vibrosonic, and early Tremolux amps. Replaces the 125C1A style choke with 2-13/16" mounting centers, 2" tall. 3H, 100 ohms, 1lb. Replacement Choke for Deluxe, Vibrolux, and later Tremolux amps. 2" mounting centers, 1-3/8" tall. 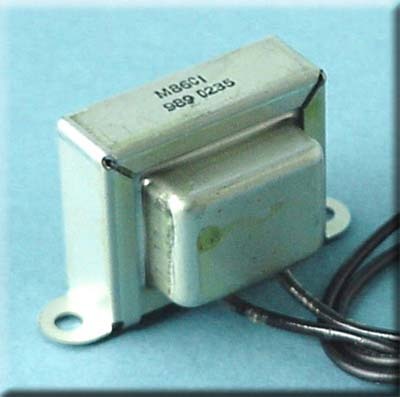 Replacement Reverb Transformer for most Fenders. 1-23/32" mounting centers, 1-3/4" tall. $50 minimum per order. No substitutions. Call with order and credit card info. No changes/additions to orders once processed.